I don't make homemade pizzas enough! They are so easy to customize and perfect for a night in or for entertaining. I recently made a BBQ Chicken Pizza and it was a hit. I call it semi-homemade because I don't make my own crust :). Gather a few ingredients (and in my case a fresh, store bought pizza dough), bake, and enjoy pizza made at home! I used this recipe I found on Pinterest. Roll out the dough on a floured surface and place on pizza stone. Add a layer of BBQ sauce on top of dough, leaving a little edge for the crust. Sprinkle cheese over BBQ sauce (use desired amounts of both sauce & cheese). Next, add a layer of chicken mixed with BBQ sauce (I chopped and cooked my chicken on the stovetop with a little extra virgin olive oil and McCormick's Steak Seasoning). Add a thin layer of red onion and your pizza is ready to go into the oven. 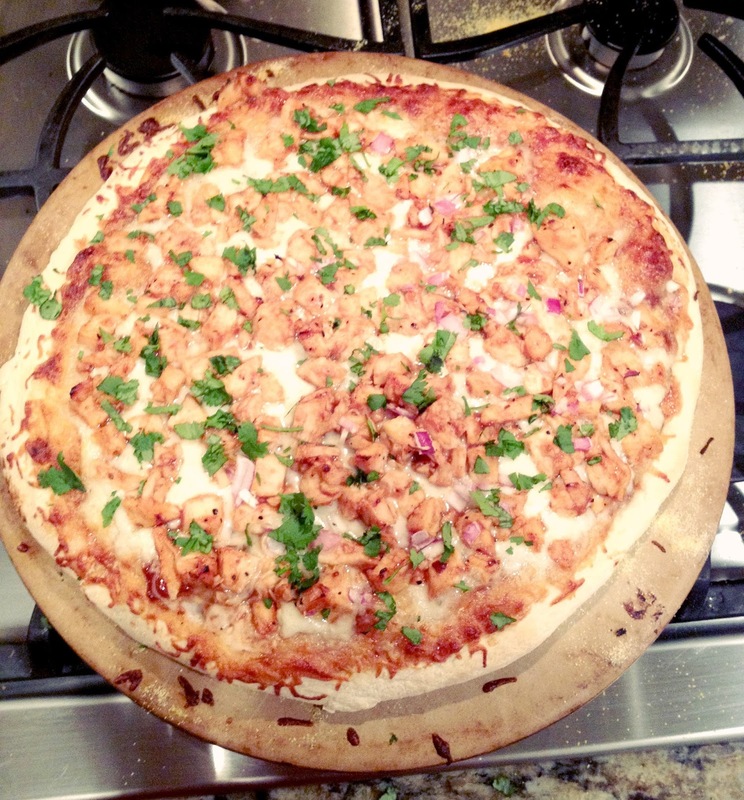 Top your pizza with cilantro once it is out of the oven and enjoy!! Hello friends! Well, I did not fall off the face of the earth, just off the face of the blogosphere for a little while! Between having two sets company this month, and just needing a blogging break in general, I put my blogger hat on a shelf for a few weeks. I've said before that blogging is by no means a "job" for me. 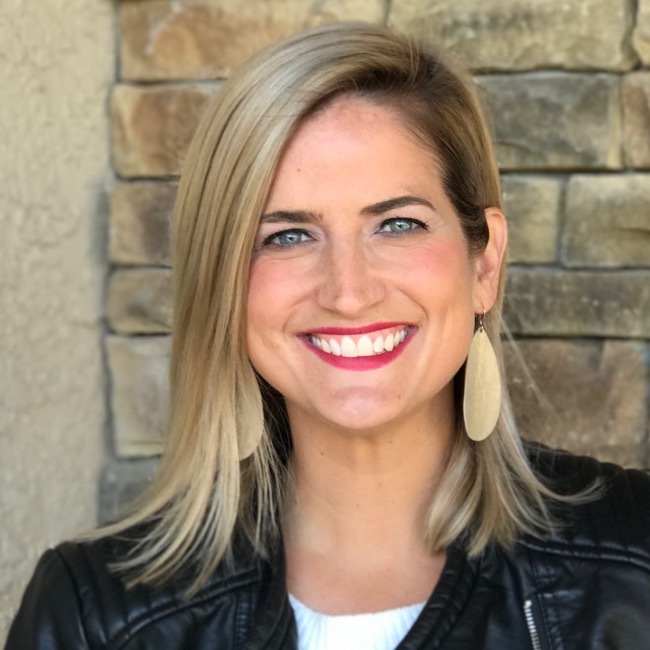 I blog because I enjoy it and I like interacting with friends, readers, and other bloggers. I like to keep it real here. I like having a place I can be myself and share whatever projects/life events that might be happening. Thank you all for sticking with me, and a big thanks to reader, Brenda, who sent me a sweet note making sure I was okay and prompted me to get the ball rolling again! Back to business now! I ordered a new rug for underneath our kitchen table. I am undecided on whether or not I think it's too small for the space? The chairs fit on the rug, but I'm afraid it might get annoying when some of the chair is off the rug when someone is sitting at the table? The problem is that the space is not that large, and the next size up would be way too big. So, it's either this size or nothing at all (I just unrolled it, so it's not laying flat yet). Thoughts? We have had this kitchen table for years and years. I updated it a few years ago and purchased two new end chairs, but I still don't love it. It works for now and it's in great shape, so we have decided to keep it for a few more years. When you can't change the big ticket item, change something around it! I also wanted to break up all of the dark hardwood in the space, so I thought an indoor/outdoor rug would be my best bet. I'm a huge indoor/outdoor rug fan. So many choices, durable, washable, and inexpensive! I have an indoor/outdoor runner at my front door and one coming off the garage door. I think an indoor/outdoor rug is a sure bet underneath an eating area. 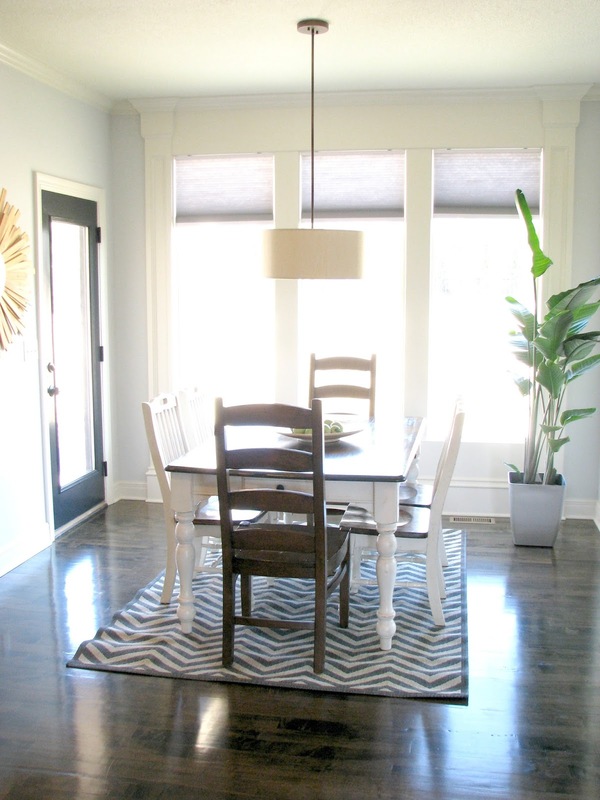 I went with this Ballard Designs zig zag rug in Grey/Sand. I got it for 20% off, keeping it under $100 (including shipping). 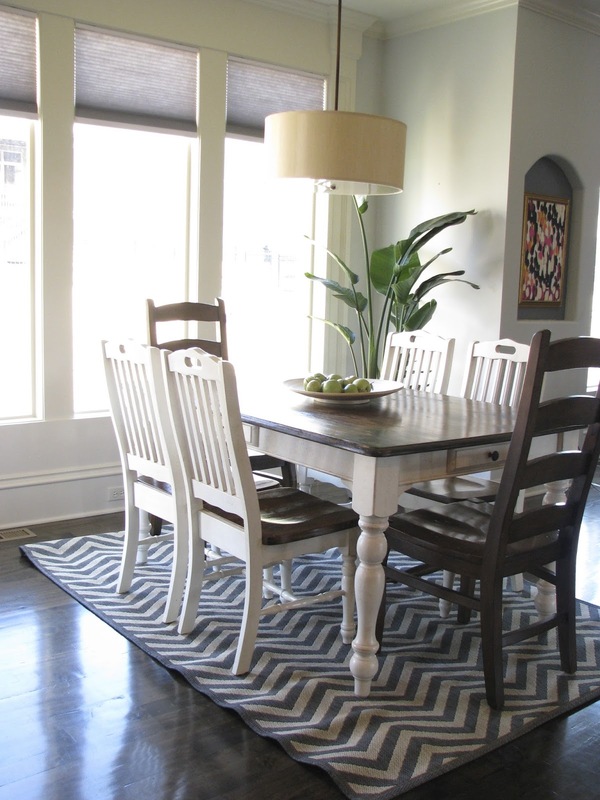 This is an inspiration image from Ballard Designs that I just L.O.V.E that includes the zig zag rug. Here is another angle in which I think it might look too small? I will keep you posted I what I decide. I love the look of a rug, so I think I'm sold that I need something, just not sure if I will be able to find the right size. Maybe I'm over thinking it and this one will do, it's just how my crazy brain operates! 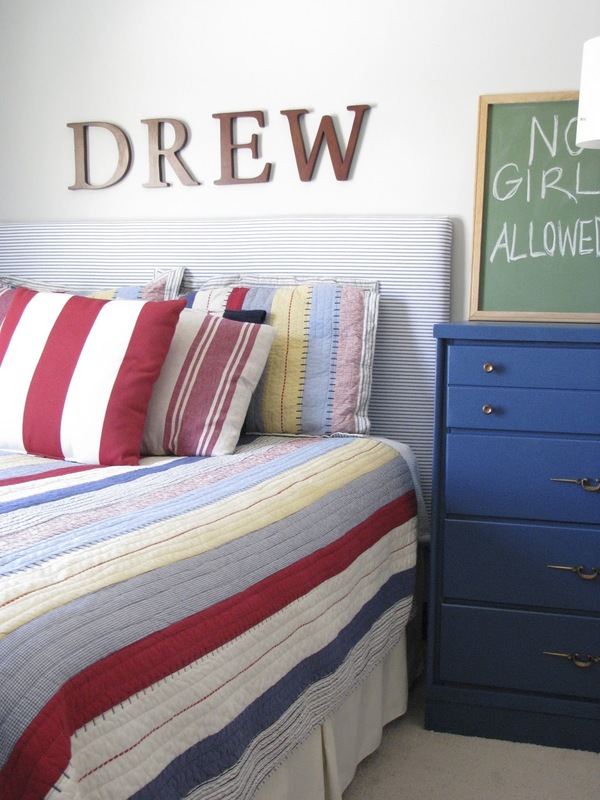 Drew moved into a big boy bed right around age two, when we lived in South Carolina. I managed two cribs in the nursery for awhile (kids 15 months apart remember! ), but I finally felt Drew needed his own space, and was ready for a big boy bed (he was crawling out at this point and nap time was becoming an issue). We already had a queen sized bed for guests, which we transitioned him into. The bed was just a bed, no headboard or footboard. 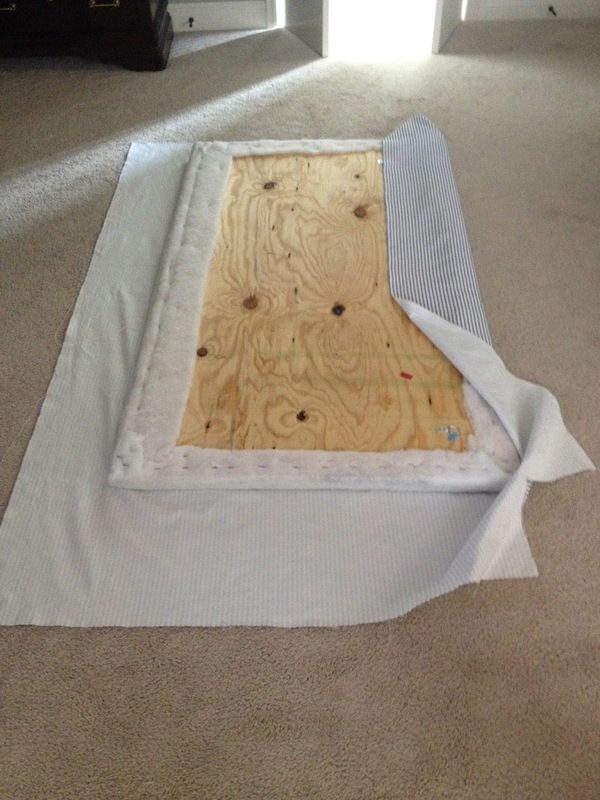 We decided to go ahead and DIY a simple upholstered headboard instead of purchasing something more expensive. We bought a piece of MDF, some foam padding, and some batting, and got to work with some navy fabric, spray adhesive, and a staple gun. This headboard has worked out perfectly for our needs. It is large, soft, and held up through two more moves (San Antonio and on to Kansas City). I bought some clearance fabric at Home Fabrics a year ago knowing that it would be perfect for when I eventually needed to replace the fabric. It's now been over 4 years since we first made this headboard. 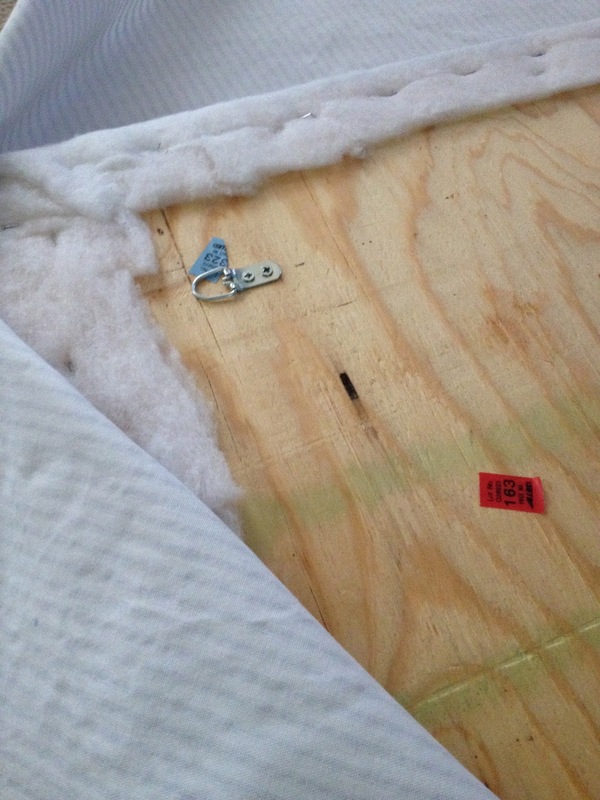 When we replaced Drew's light fixture recently, I decided it was a good time to replace the fabric on his headboard. It's striped. Go figure. The foam and batting were already secured, so I just needed to remove the old staples/fabric, and staple the new fabric to the back. I was able to do this on my own. Just make sure you are pulling and tugging as tight as possible! I do top, then bottom, then side to side, pulling tight and making sure the stripes stay lined up. This is the story of my life. These little moving stickers are on the back of everything we own! You can see in the photo the hardware we use to hang this big guy. Make sure you use strong anchors that can hold a good amount of weight! This is such a simple and inexpensive project. I was afraid an upholstered headboard wasn't going to be boyish enough, but in the end, I think the square lines and simple fabric keep it from looking to "girly". Kate sleeps in a twin, so Drew's bed is the one we all pile into at night for reading time. The large, soft headboard is perfect for lounging and reading! 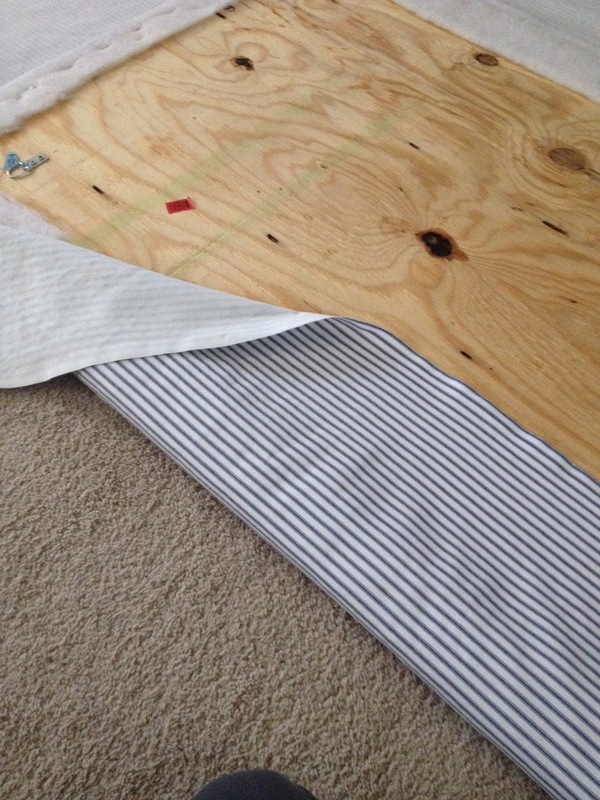 The best part is, if you get sick of the fabric, or if it gets dirty/dingy, just change it! You can see the details for Drew's bedding in this post. It has also held up for multiple years, and multiple washes!